The VML policy committee meeting day has been set for Thursday, July 18, at the Marriott Hotel in downtown Richmond. All committees will meet that day. VML’s policy committees meet each year to learn about and discuss current issues, develop positions on emerging issues, and review and revise VML’s current policy positions. Each committee also recommends issues to the VML Legislative Committee as it develops the annual legislative program for the League. Any VML full-member community can nominate members to serve on these committees. Information about the 2019 committees was sent to each manager and clerk two weeks ago to share with their councils and appointed officials. This full day conference is offered by the Virginia Municipal League twice a year; it is designed primarily for newly elected officials, but it is also a useful refresher course for incumbent officeholders and staff. The cost is $35 per person which includes lunch and copy of the FOIA/COIA handbook. Join VML’s experts at the Holston Hills Community Golf Course and get the details of the big issues brought before the Assembly this year. The fee is $35. Please indicate your choice of entrée when registering. Additionally, the Town of Marion will be sponsoring a free round of golf or a bucket of balls on the driving range for anyone interested. The 2019 session of the Virginia General Assembly enacted state tax reform in response to impacts from the Federal Tax Cuts and Jobs Act of 2017 (TCJA). The new state tax law returns (or intends to return) individual income tax revenue resulting from enactment of the TCJA to taxpayers. Most of the additional new business-related tax revenue generated for the state as a result of the TCJA is retained in the state General Fund. This business-related tax revenue is expected to grow to over $400 million annually by FY23. The TCJA was the largest federal tax reform legislation in over 30 years – impacting both individuals and businesses. Beginning in tax year 2018, federal tax changes included up to 20 modifications for individuals and up to 30 modifications for business and corporate tax returns. The estimated federal tax impact on Virginia residents and businesses amounted to a reduction of about $4 billion per year in federal tax collections mainly due to a lowering of federal income tax rates. In contrast, the TCJA modified income definitions and rules that created large potential state revenue increases by subjecting more income to Virginia’s unchanged tax rates. Without changes to Virginia tax law, estimated increases to state revenue resulting from the TCJA would have amounted to $594 million in FY19, growing to $950 million in FY24. Individual income tax changes under the new federal law are temporary and expire after tax year 2025. The business tax changes are permanent. Over the years, Virginia has routinely conformed to small changes in federal income tax laws. However due to the large changes in TCJA, Virginia conformity to the new federal income definitions was a bigger issue than is usually the case and became wrapped up in the larger Virginia tax reform response to TCJA. The enactment of HB2529 / SB1372 conformed Virginia to most new provisions in TCJA beginning in tax year 2018, while also altering several Virginia income tax provisions to provide tax relief. Under the altered provisions, Virginia will provide a one-time individual income tax refund prior to October 1, 2019 to all taxpayers with tax liability of up to $110 for single filers and $220 for married filers. These refunds are contingent on FY19 revenues increasing as expected, with the refund cost being $420 million. For businesses, $32 million in permanent tax relief is provided beginning in tax year 2018 by 1) a subtraction modification to certain corporate global intangible low-taxed income (“GILTI”) and 2) a partial 20 percent restoration of net interest deductions eliminated in the new federal law. Finally, an additional $80 million is reserved in the Taxpayer Relief Fund in FY19. In total, $532 million is returned or reserved for taxpayers from FY19 revenues, equaling the estimated individual income revenue resulting from federal tax reform. The remaining $62 million, mostly resulting from federal business provision changes, remains in the state General Fund. The bulk of the new state tax reform is effective in tax year 2019 through tax year 2025 – matching the temporary nature of the federal individual tax changes. For individuals, the Virginia standard deduction is increased from $3,000 to $4,500 for singles and married filing separately, and from $6,000 to $9,000 for married filing joint returns. New state law de-conforms from the federal $10,000 limitation on property tax deductions and allows an individual income tax deduction for the actual amount of real and personal property taxes imposed by Virginia or any other taxing jurisdiction. New state tax law also re-imposes the “Peace” limitation for high income taxpayers. This reduces itemized deductions by 3 percent of the amount by which a taxpayer’s adjusted gross income exceeds the threshold amount ($261,500 for singles; $313,800 for married filers). Finally, any individual taxpayer revenues generated from TCJA above the amount returned must be transferred to the Taxpayer Relief Fund for future tax relief. The following table presents the estimated state revenue impacts from the TCJA and the corresponding enacted state tax reform. For the governor and the legislature, the highest budget priority was adding $835 million to GF reserves from the additional $1.56 billion in new available GF revenues. 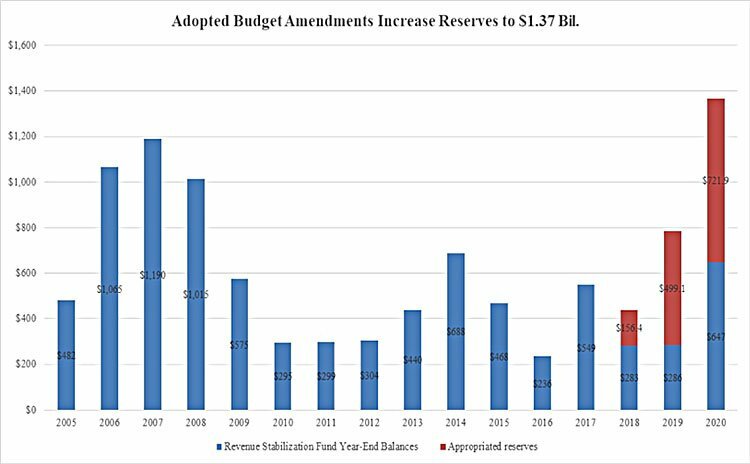 The logic for these new reserves was to increase the state’s liquidity to order to weather any future economic downturn and to protect Virginia’s Triple A credit rating. As such, the funds were added to the Cash Reserve Fund and the Rainy-Day Fund. By: James Regimbal, Fiscal Analytics, Ltd.
VML is pleased to announce that our former president and current Newport News councilwoman Dr. Patricia Woodbury has been named to the TSA’s Surface Transportation Security Advisory Committee (STSCAC). The STSAC will include 35 voting members. Dr. Woodbury will serve on the subpanel Groups Representing the Users of Surface Transportation. A full list of voting members can be found here. The committee also will include 14 nonvoting government members from the Departments of Defense, Energy, Homeland Security, and Transportation as well as the FBI and NTSB. “The knowledge and expertise these leaders bring to the table will play a vital role in TSA’s continued efforts to safeguard the nation’s surface transportation systems,” Pekoske said in a statement. 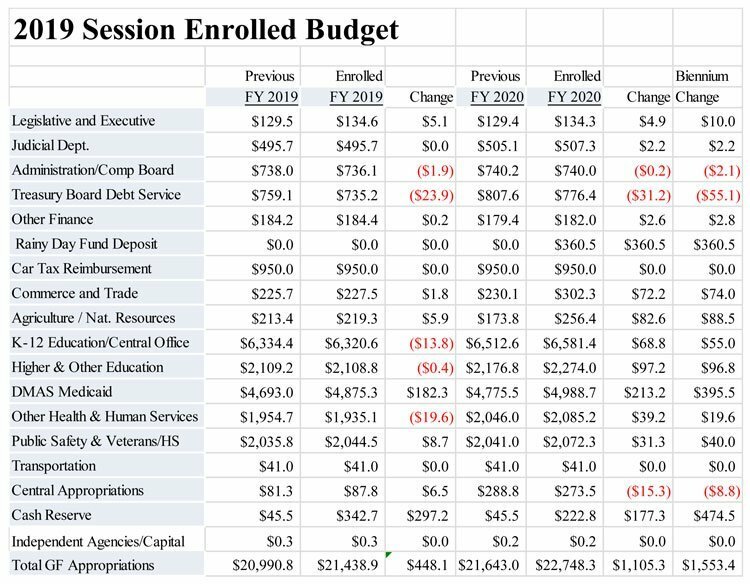 Before we dive into the details of what changes the 2019 General Assembly made to the state General Fund budget, let’s look at the budget/tax highlights. As part of the 2019 General Assembly session amendments to the 2018-20 biennium budget, General Fund (GF) revenues available for appropriation increased $1.564 billion compared to the budget enacted last May. This is primarily due to the FY18 revenue surplus ($553 million) which was carried forward into FY19. This FY18 surplus also increased the 2018-20 biennium revenue base. In addition, federal tax reform is expected to result in additional revenues for Virginia’s state income taxes due to a variety of factors that change taxpayer behavior, such as the cap on federal itemized deductions and the increased federal standard deduction. Without changes to Virginia’s income tax laws, an estimated $1.2 billion in additional revenues for Virginia was expected in the 2018-20 biennium due to the federal tax reform. However, the General Assembly did enact tax reform that reduced the expected dollars for the state treasury from federal tax reform revenue by an estimated $976 million – leaving about $230 million in additional revenue for appropriation in the budget. Finally, the 2019 General Assembly enacted legislation requiring all internet-based companies above a minimum threshold of transactions to begin collecting sales taxes on July 1, 2019. Beginning in FY20, internet sales tax collections will increase state and local revenues by about $150 million per year ($82.5 million GF). All together these changes result in GF revenue and transfers growth of 3.2 percent for FY19 and 4.8 percent in FY20. Because the General Assembly did not “count” or “recognize” the federal tax reform dollars in the budget, tax collections will need to increase by 5.9 percent rather than the official 3.2 percent forecast. Otherwise, the tax refunds will be prorated if actual FY19 revenues do not exceed the official forecast by $450 million. On Thursday the April 11, the Virginia Department of Emergency Management (VDEM) and the Virginia Modeling, Analysis and Simulation Center (VMASC) at Old Dominion University convened their fifth annual meeting of public safety stakeholders in Glen Allen, VA. The purpose of these meetings is to allow representatives from local first response agencies and relevant statewide organizations, including VML and the Virginia Emergency Management Association, to provide input on guidelines and potential application categories for the agency’s Homeland Security Grant. For 2019, a total of $7.45 million will be available for grants, of which 80 percent is expected to support local projects. Based on feedback from attendees and 2018 applicants, proposal criteria are likely to remain largely the same as those from the 2018 application process. Broader guidelines from FEMA, as the federal funding source, are expected in the coming days, though an official date has not been announced. VDEM will announce the release of the grant shortly afterwards, with a preliminary projected deadline of May 15. The National League of Cities (NLC) is committed to supporting a fair and accurate 2020 Census, which will be underway in less than twelve months. To better understand how municipalities are preparing for 2020 and to better target their resources to support cities, towns and villages, they have asked us to share a quick survey with you. We would appreciate if the relevant member of your staff would complete the survey linked below about your municipality’s 2020 Census preparations. You can access the survey here: NLC Local Census Preparedness Survey. On the Thursday, May 16 the Virginia Department of Housing and Community Development (DHCD) and the Virginia Main Street Program, in partnership with Virginia Housing Development Authority will sponsor a day-long session designed to introduce the principles and implementation mechanisms behind neighborhood-based development projects. The specialized training will cover development of small residential, commercial, and mixed-use properties (1-3 story buildings with less than 20 units). The course assumes participants know a lot about where they live, but not necessarily about real estate development. The session will take place from 8:00 AM – 5:00PM at the Stonewall Jackson Hotel & Conference Center in Staunton, VA. Registration is available here. A short video about the session is available here.